We’ve reviewed a couple of different mobile device-based universal remote control systems. 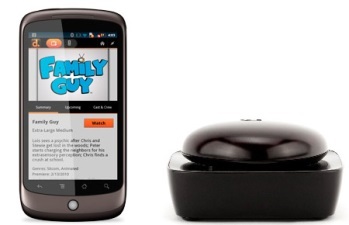 Some are platform specific, such as the VooMote Zapper, which is geared toward iOS devices. Others come in multiple flavors, such as the Griffin Beacon. We reviewed the Griffin Beacon with an iPhone. At the time an Android version was still in the works. Now that it is available, it’s worth checking out how it performs. The Android version of the Dijit app that pairs with the Griffin Beacon certainly appears to be a bit different than the iOS version we looked at. I have too many remotes, I’ve got seven of them for my home theater system, that’s just too many and it can get confusing at times. I need a universal remote, but I’ve yet to find one that works with everything I own. Today for review I have a product from Griffin called the Beacon and it’s basically a universal remote, but it works with Android devices.